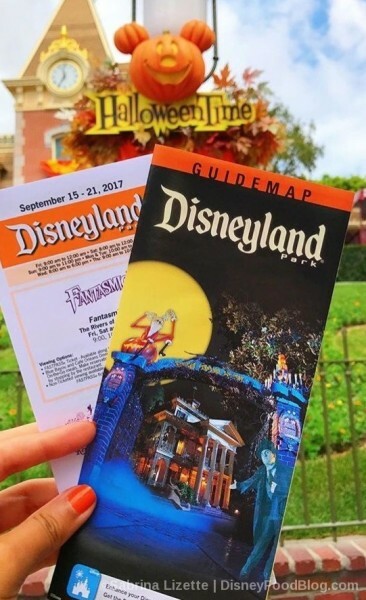 WE’RE LIVE at the First Mickey’s Not-So-Scary Halloween Party for 2018! BOO to YOU from Mickey’s Not-So-Scary Halloween Party!! 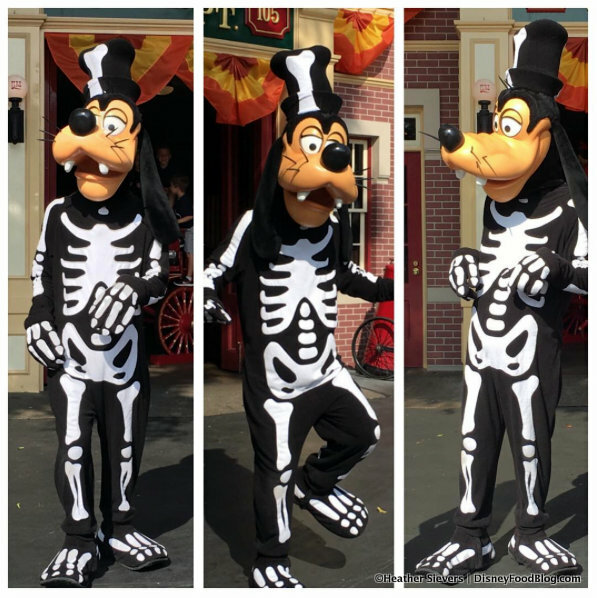 Mickey has just kicked off his very first Party of the Halloween Season in grand style. This extra-ticket event will run on select nights (find the dates here) in the Magic Kingdom from now through the BIG DAY… October 31st for Halloween! 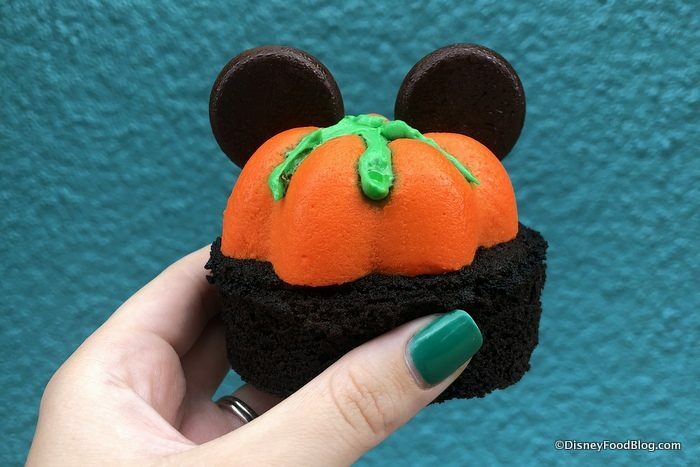 Snacks Get SPOOKY for Halloween in Disney World’s Magic Kingdom — Including Mickey’s Halloween Party Exclusives! Hello… and BOO!! Or perhaps I should I say Trick or Treat?! 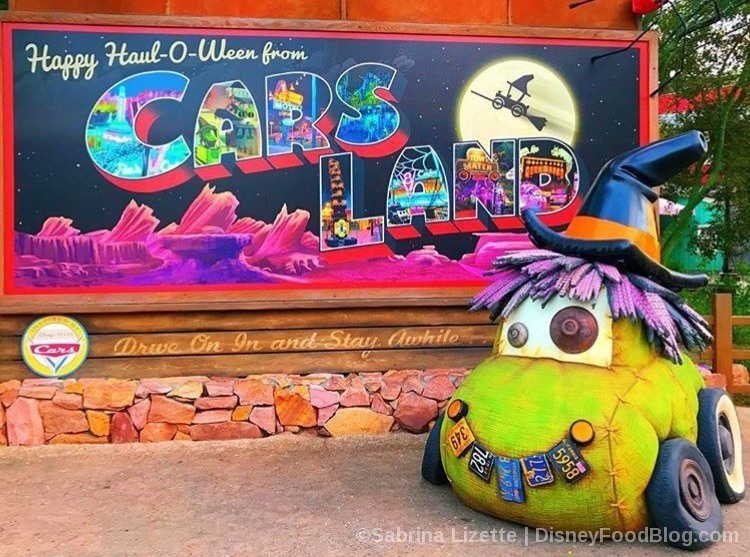 Because we’re about to take a look at some seriously spooky snacks coming to Walt Disney World for Halloween! 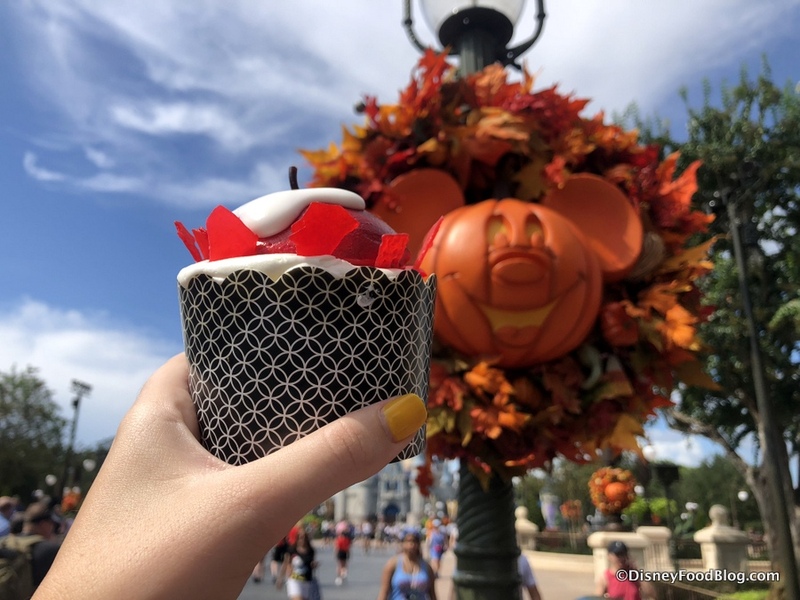 Like last year, some of these treats will be available all day for Magic Kingdom guests, while some will be exclusive to Mickey’s Not-So-Scary Halloween Party… at first! 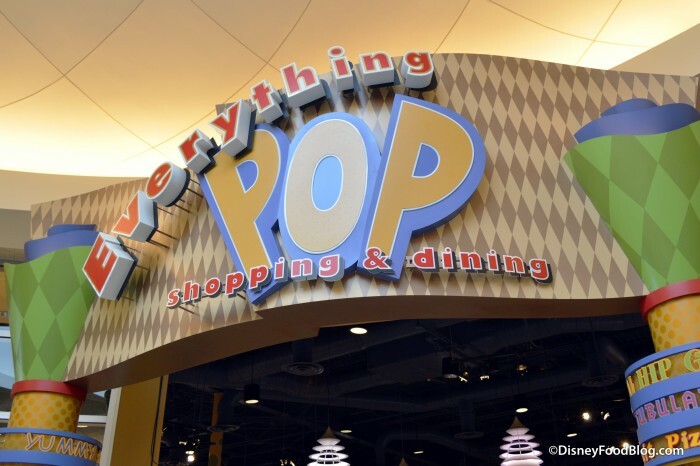 Stay tuned throughout the post, because though some snacks will make their debut at the Party, a few will be available to all Magic Kingdom visitors later in the season! And if this all seems a little too soon… it’s not. 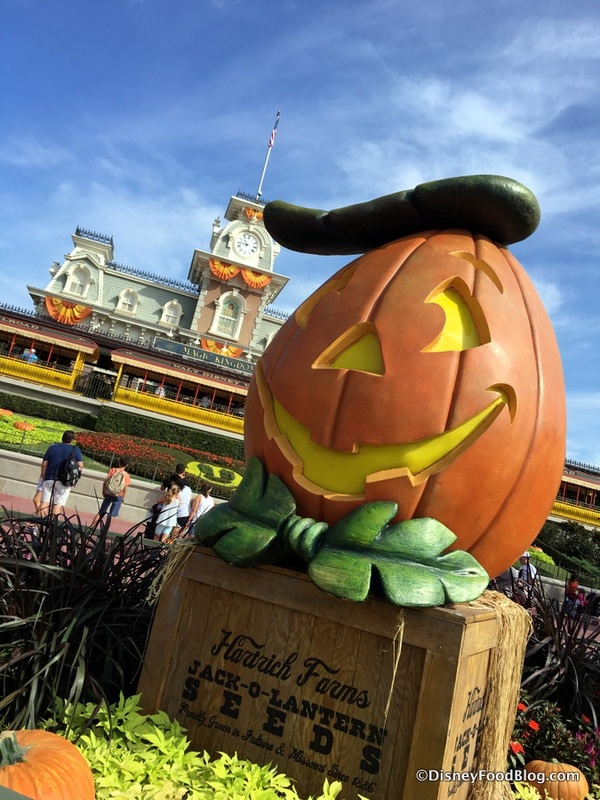 Because Mickey’s Not-So-Scary Halloween Party kicks off on August 17th… tomorrow night!! 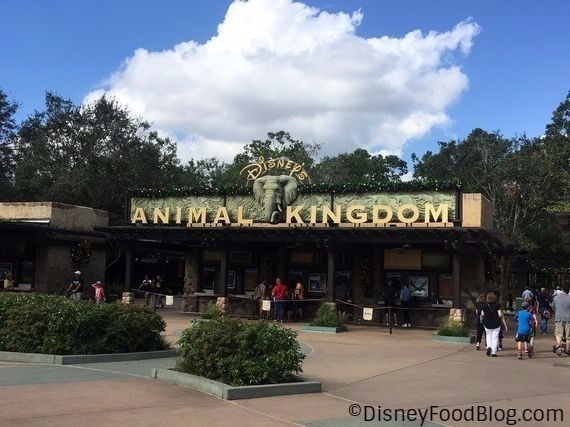 You know we love to bring you the latest Disney World food news, and this week we are checking out What’s New at Animal Kingdom and the All-Star Resorts! There is a TON of seasonal fun going on as we officially enter the Holiday Season, so get ready to join us and see it all! 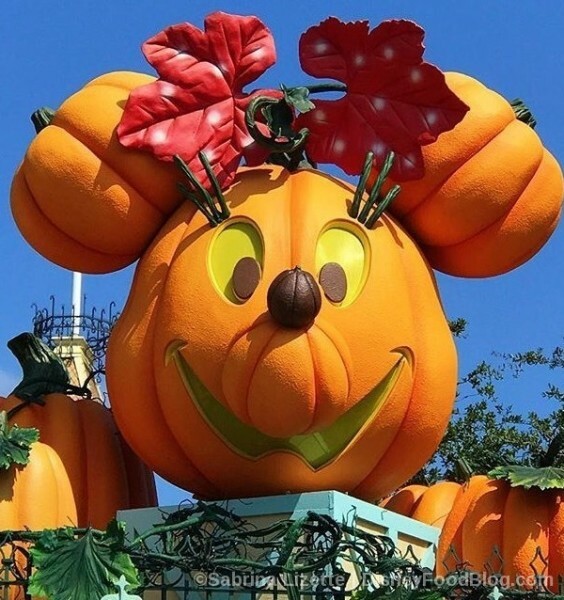 It’s Fall and Halloween Time at the Disneyland Resort is upon us! 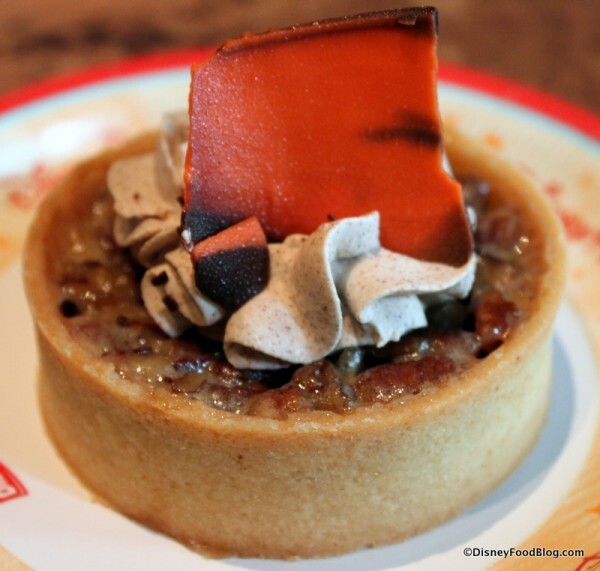 The Jolly Holiday Bakery Cafe at Disneyland has added some seasonal items to their repertoire that you don’t want to miss! On a recent visit I tried several new items, and I’m happy to say there wasn’t a bad one in the bunch. It’s really hard to choose a favorite because each one of these was pretty darn delicious. I think though, I’m going to choose the Spiced Bundt Cake as my favorite. It had a unique Fall flavor to it and although I LOVE pumpkin, it’s nice to get a little variety of flavors to celebrate the season. This cake was so moist; the knife slid right through it as I cut it in half. 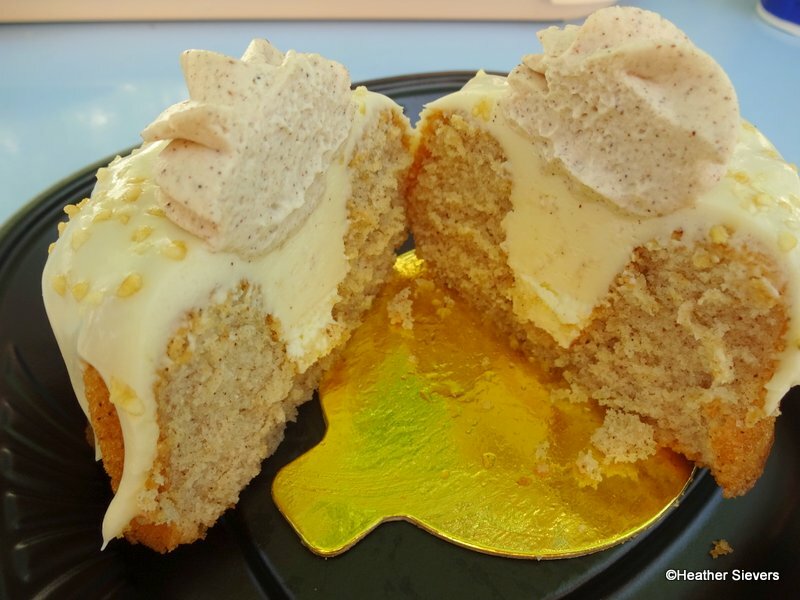 It had a nice spice flavor to it, not too overdone; and it had delicious vanilla custard-like frosting that was generously drizzled over the top and made its way into the center of the cake as well. My favorite thing about this cake was that amazing cinnamon whipped cream on the top. It was light, fluffy, and really a great addition to this year’s seasonal items. 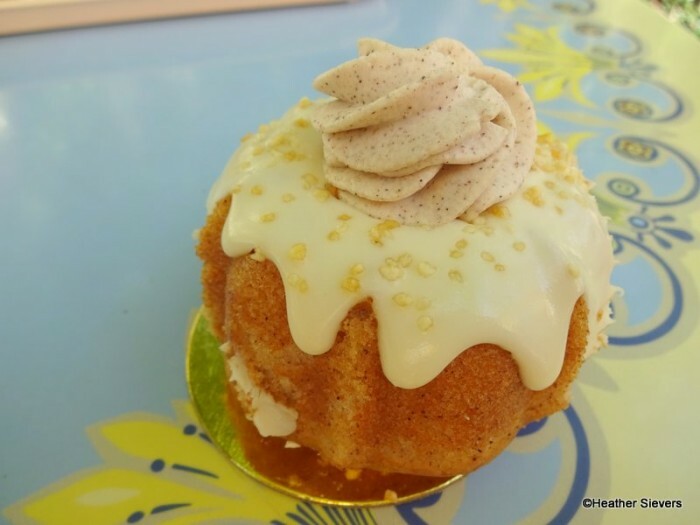 The Spiced Bundt Cake is $5.19 and generously sized. Next up is the Pumpkin Cheesecake. I absolutely loved this dessert, but it was really more like pumpkin pie than cheesecake. The “cheesecake” part was basically pumpkin pie filling. Don’t get me wrong, I’m not complaining; it was really great. 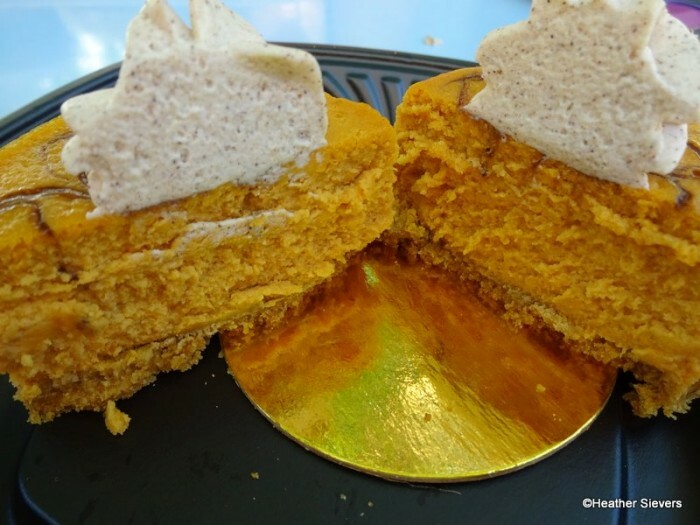 But, when I took a bite, I immediately thought “Pie.” There is a thin layer of graham cracker crust on the bottom, which is definitely a cheesecake trait, but overall… Pumpkin Pie. Cheesecake and pumpkin pie fans alike will love this dessert. It’s also topped with that glorious cinnamon whipped cream that I mentioned above. Perfect for sharing, a serving of Pumpkin Cheesecake will set you back $5.39. Normally I’m not a huge eclair fan. I’ve tried each different flavor from Jolly Holiday since it’s been open and have never gone back for seconds… The Caramel Eclair, though, is actually much better than the ones I’ve had in the past. The Caramel Eclair reminded me of a cream puff. The flavor was mild and the texture of the pastry was just right. To me it tasted of vanilla with a hint of caramel. Still not my favorite treat, and I probably would choose something else over this one, but in my opinion, a big improvement on flavor from the last few I’ve tried. Also, I feel like in the past I may have gotten an eclair that was not so fresh and a little to hard to chew. This one was softer and tasted very freshly made. 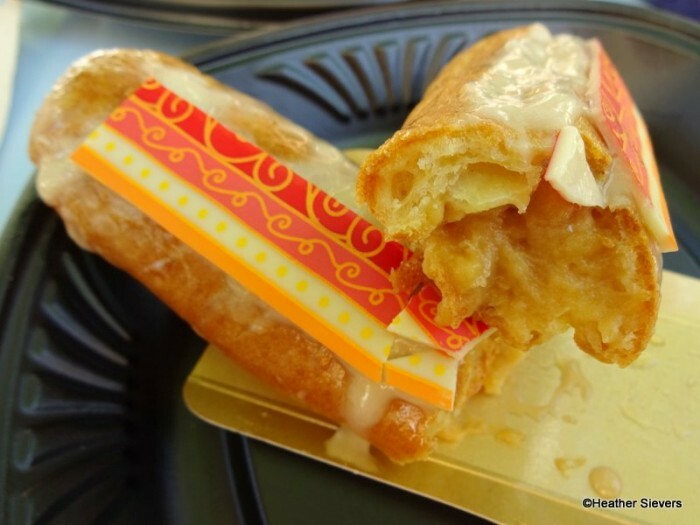 If seasonal flavors aren’t your thing, Jolly Holiday also offers a Signature Chocolate Eclair year round. 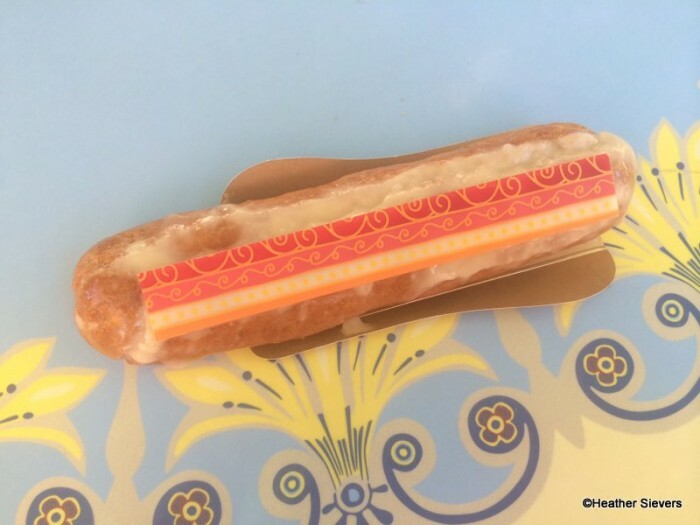 The price of an eclair is $3.99. 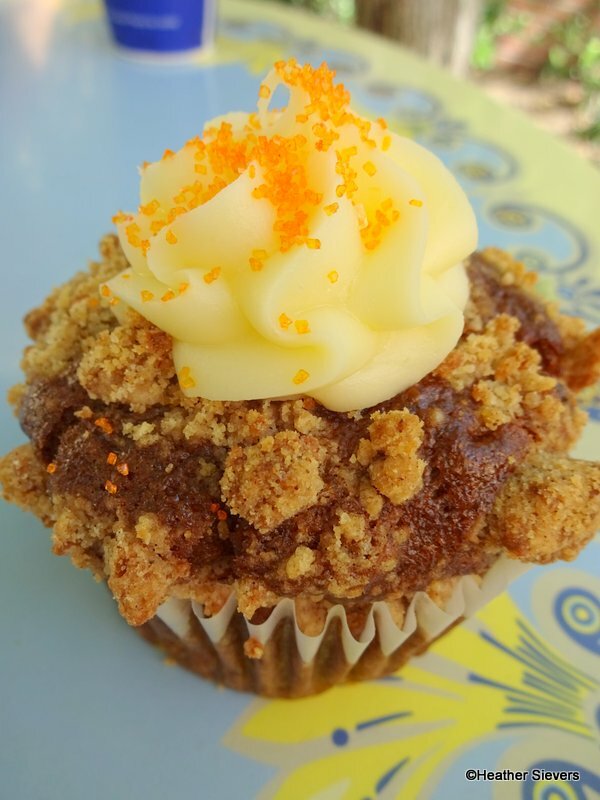 Every year I look forward to the return of the Pumpkin Muffin! This is one of my staple seasonal eats. 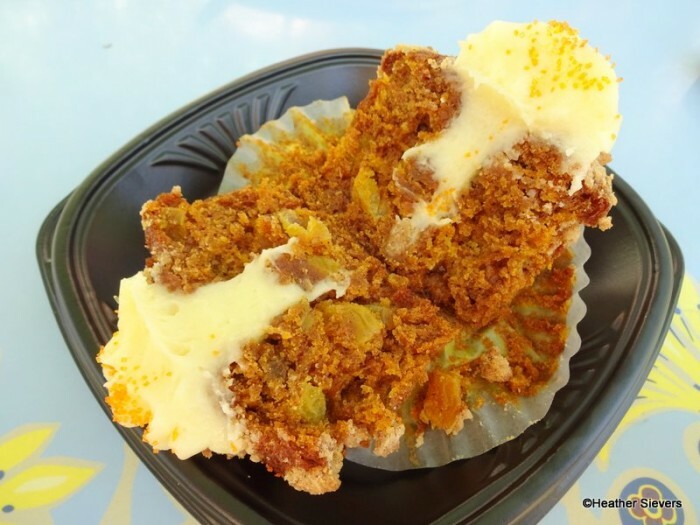 The Pumpkin Muffin never disappoints. It’s the perfect treat, sort of dessert-like, sort of breakfast-like… Versatile, right? It’s back this year and better than ever. Moist, pumpkin goodness filled with golden raisins and just the right amount of Fall spices. Topped with streusel crumbles and a generous amount of cream cheese frosting that makes its way into the center of the muffin as well. I absolutely love this muffin. It can be yours for $3.49, which is cheaper than a cupcake, but you’ll still feel like you’re eating one! Overall, I highly recommend a visit to Jolly Holiday. They have so many great options in their bakery case, both seasonal and year round. 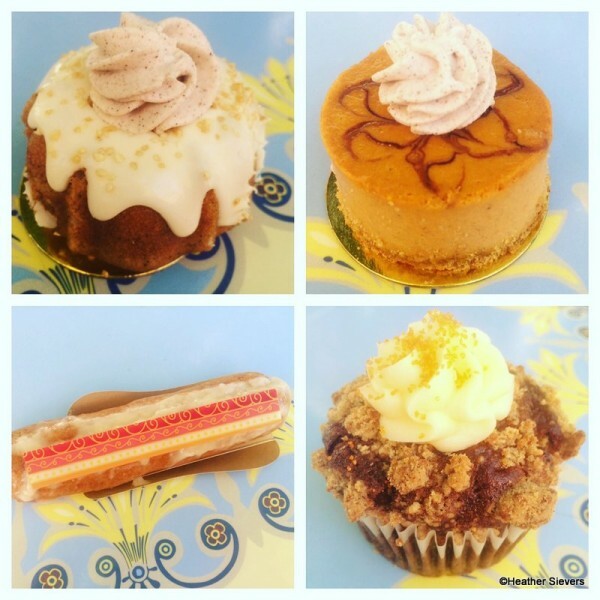 Have you tried any of these Fall specialties yet? Did you have a favorite or which would you choose? Let us know in the comments below! 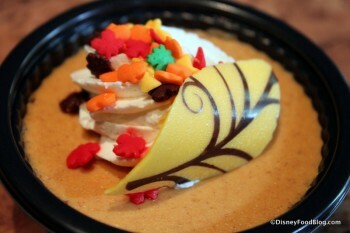 With Thanksgiving behind us, we’ll be diving into even more holiday goodies at Walt Disney World and Disneyland!! Of course, we just have to look one more time at some of the Fall treats that added colorful and tasty options to the bakery cases. 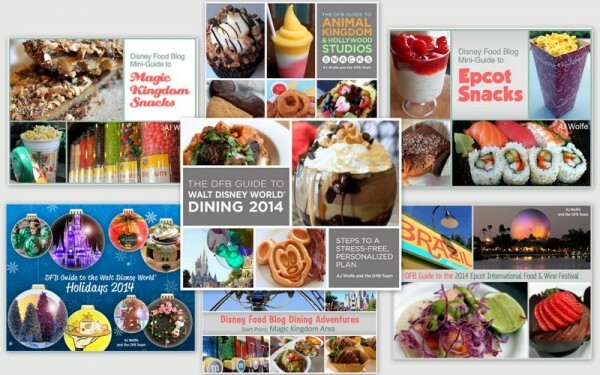 One of our favorite stops recently — The Mara at Disney’s Animal Kingdom Lodge. 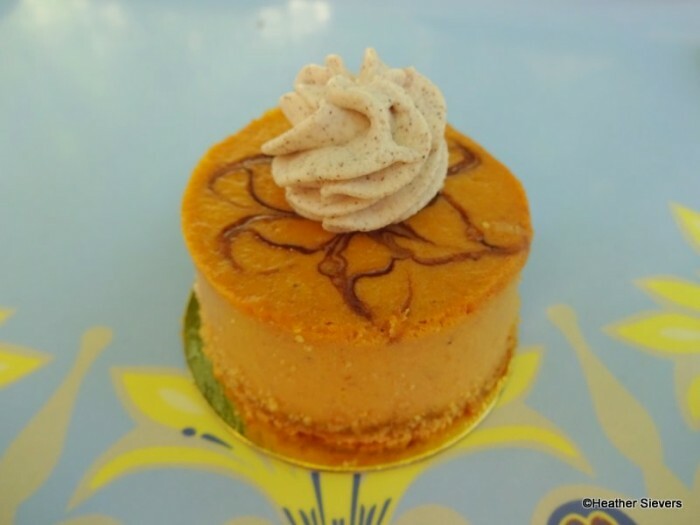 We sampled two Autumn desserts, Check out the Chocolate Pecan Tart and Pumpkin Cheesecake! Visit the links below for more delicious tidbits! L’Artisan des Glaces in Epcot’s France pavilion is now offering a peppermint macaron ice cream sandwich with gingerbread ice cream. We have some delicious Fall treats for you from The Mara at Disney’s Animal Kingdom Lodge! Disney’s Grand Californian Hotel at Disneyland debuted a new gingerbread house for this holiday season! Check out the new Big Hero 6 Teriyaki Street Dog and Coconut Milk Tea at Disneyland’s Award Wieners! 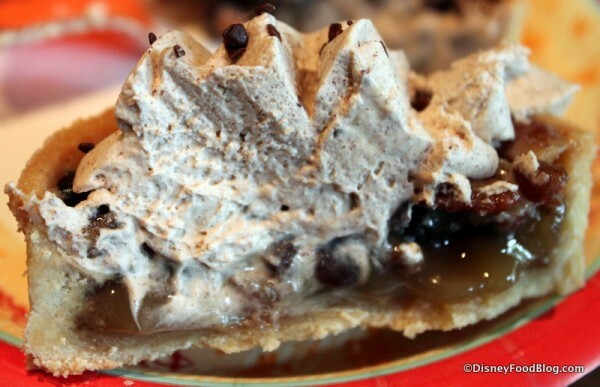 After our Thanksgiving feasts, it’s time to look at some healthier options at Disney. 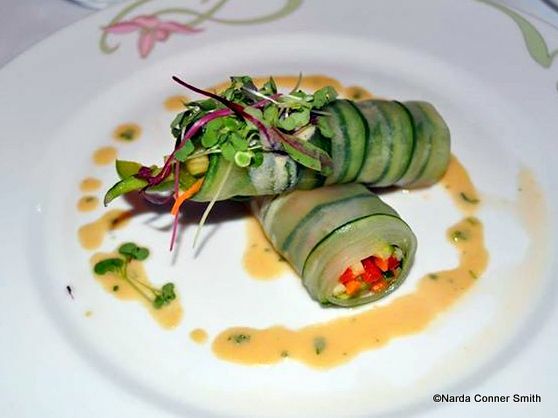 First up, Cucumber Wraps aboard the Disney Fantasy courtesy of our Facebook Friend Narda. 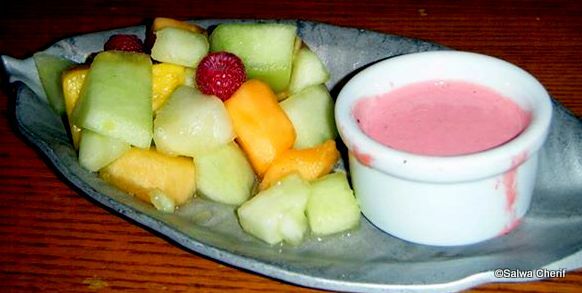 Or how about some delicious fruit from ‘Ohana at the Polynesian Resort in Walt Disney World. Salwa, our Facebook Friend, sent in this photo. Yum! Have you enjoyed a favorite find? Send in your Disney food photos! DFB Black Friday Weekend SALE! With Autumn waning, and the Winter Holidays just around the corner, we couldn’t resist offering you one last beautiful, delicious look at this colorful season. Fortunately, a trip to The Mara provided a couple of great options to celebrate the season. Having enjoyed lunch in the Parks, I decided to drop by The Mara and see what was new in the pastry case. I was excited to see lots of Fall colors and flavors! The first sweet that caught my eye was this Autumn-Themed Chocolate Pecan Tart. The bold colors of the Chocolate Garnish were the perfect complement for the season. And I was intrigued by the obvious color in the Whipped Cream that topped the Tart. Cutting into the Tart, it was obvious that this was a rich, moist pecan pie filling — nothing dry about this!